Co. Antrim: Ballycregagh, Ballyhoe, Ballymoney (2), Benvardin, Carnmoon, Castle Quarter, Corkey, Dervock, Dunloy, Dirraw, Enagh, Killagan, Lower Killoquin, Upper Killoquin (2), Kilraghts, Seacon, Stranocum, The Vow. Co. Londonderry: The Grove (2), Hervey Hill (2), Kilrea (2), Tamlaght (2). The Board also included 9 ex officio Guardians, making a total of 37. The Guardians met each week on Monday. The population falling within the Union at the 1831 census had been 51,869 with divisions ranging in size from Corkey (population 1,133) to Tamlaght (3,742) and Ballymoney itself (3,249). The new workhouse, built in 1842, was designed by George Wilkinson. It occupied a six-acre site to the west of Ballymoney at the south side of the Coleraine road and could accommodate 700 inmates. The cost of the building was £6,785 plus £1,240 for fixtures and fittings etc. It was declared fit for the admission of paupers on 15th November 1842, and admitted its first inmates almost four months later on the 6th March 1843. The site location and layout are shown on the 1906 OS map below. During the famine in the mid-1840s, a female probationary ward was altered to accommodate an additional 50 inmates. A 32-bed permanent building was erected at the west of the workhouse. At the 1901 census, the population of the Union was 28,276 including 13 officials and 148 inmates in the workhouse. In 1921, following the partition of Ireland, the workhouse became Route District Hospital. The fever hospital was subsequently demolished and some remodelling of the other buildings was carried out in 1937. The hospital buildings were demolished in 2003 to make way for a housing development. Ballymoney former workhouse site from the east, 2003. 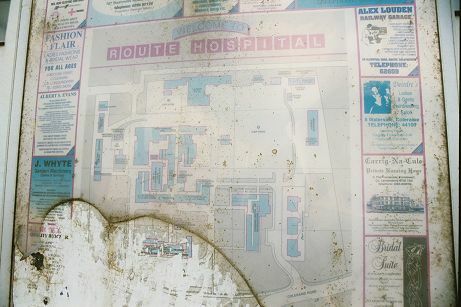 Ballymoney - Route Hospital plan, 2003. Public Record Office of Northern Ireland, 2 Titanic Boulevard, Titanic Quarter, Belfast BT3 9HQ. Holdings include: Guardians' minute books (1840-1948); Dispensary minute books (1852-99); Workhouse registers (1843-1939); Admissions and discharges (1940-43); Indoor relief lists (1943-8); Outdoor relief register (1847-8); Outdoor relief lists (1928); Outward letter books (1899-1939); In Letters (1900-26); etc.